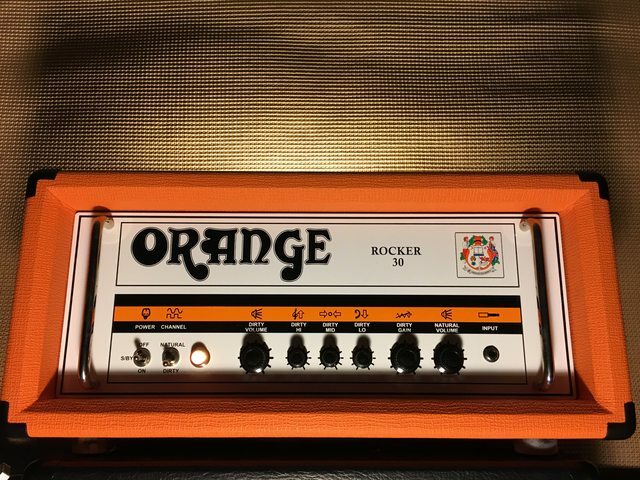 Re: Orange Rocker 15 combo + Mooer Red Truck or single pedals? Personally I'd be wary. You're buying a $250 multi-pedal setup from a bargain basement brand. I think that's a little different than trying one of the single-effect Mooer pedals which are quite cheap. You might be better off starting with one thing at a time and just delaying getting some of the pedals as you get to use the amp. E.x. just buy a Reverb right now, there are lots of good reverbs you can buy that are a lot less than the Red Truck. I have a Rocker 15 Combo too, the biggest reason I would be reluctant to throw all my eggs into that Red Truck basket is the OD and Boost on the Red Truck do not seem to give you control over the mids. That can be dangerous IME experience with the Rocker 15. By buying the red truck you're locking in whatever they decided to do on the boost and OD in terms of mids. For me what I want with my pedals is to be able to dial in settings where most of the different combinations I can turn on all sound good, regardless of which channel I use. If a pedal throws too many mids in it will not necessarily work with the natural channel unless you're really cranking the volume. Meanwhile the dirty channel loves a big fat midboost in almost any scenario. This is somewhat of an issue because of the lack of EQ on the natural channel, but then the Natural Channel sounds great on it's own so it's not the amps fault if the chosen pedal doesn't have an EQ that works with the amp. I've had a lot of ODs and disliked quite a few of them.. by far the easiest one for me to get to work really well has been the Maxon OD808. It can do great things on either channel. @beninma you also have the point my first idea was to have just a boost pedal and of the reason why I'm still not 100% that I'll buy a red truck is that it has drive and dist pedals which I probably don't need (in my opinion) because it has 2 channels. What I really need is chorus, delay and tuner (which I already have). It would be also nice to have reverb, phaser and booster - red truck is tempting because it has all that I need + flanger, tremolo, od and dist and it sounds good on youtube. Perhaps the best approach is to try it before I (eventually) buy it. I was also thinking of all analog pedals. That can also be easily archived with ehx and mooer for example, except for the reverb but I asked one of those guys who is making a pedals and he said that spring reverb tank driver pedal would cost around 30 - 40 eur (with just one pot and true by pass) but than I would also have to buy a reverb tank. I think it really depends how much you want to spend. If the Red Truck had all I need/want and was all I could budget for, I probably go with it. You can always add pedals to your chain. My first idea was to add tuner/chorus/delay/reverb/boost/wah (even if I don't use wah often) so in this case I would probably first go with ehx neo clone and memory toy (I owned them previously and was very happy with them). Then I was thinking of maybe buying mooer micro pedals since I realised that it would be nice to have also phaser and flanger since they are needed for some songs that I like to play. After all of that I've seen that mooer red truck have all of that + od and dist and it sounded good on the reviews. Even some reviewers that are harsh on equipment were praising this pedal and it's abilities. Also big + is compact size - you basically have one "big" pedal with all needed effects but without unnecessary complexity of a modeling multi effects. Regarding money I can do whatever needed - I can buy few pedals at once (or multi effect) or maybe buy one pedal per month (but I would stick to "middle class" effects like those ehx that I mentioned). As I said I'm not pro so it really doesn't matter if I buy some of the effects in 6 months (or even not buying them). You can get delay/chorus/vibrato with one of the EHX style pedals, memory man/memory boy family. Memory Boy is < $100 and is amazing, you could add a cheap/used reverb & boost as well and stay pretty cheap. Personally I would not buy the Red Truck for myself without being able to try it locally with a Rocker 15 + My guitar. It's too expensive of an experiment for me. Around here every Guitar Center has a Rocker 15 so if they stock a pedal I'm interested I can take my guitar in and try it. Every review site has a couple people who bought a Red Truck who had it break. Money not being an issue, personally I’d buy the pedals I want. The Red Truck might be great, but it’s jumping on the idea being the Sansamp Fly Rig, something you can easily throw in your carry on baggage and not worrying about specifics. @beninma Orange dealer is also dealer for Mooer, EHX and TC so I'll be able to test everything before purchase. @Jondog I probably forgot to mention but one of the most important pros for red truck is that it's "fly rig" like pedal. This is because I have two small kids so when I play at home it's easier to connect it out of gig bag and it's also easier to carry around when I play out of home. Of course I would first have to try and see if it works good with the amp (this is also true for all other options). If you can try it all with the right amp & guitar than your opinion will be more important than anything we say. There is also one option that I completely forgot and I have it before - zoom ms 70 cdr. I was using it in the effect loop of my marshall dsl1 and I was able to get really good sound. This unit have a lot of modulation effects, delay and reverb (and tuner also) so it can cover everything that I actually need but same as with the other pedals/multi effects that we mentioned I would have to try it first. The good thing is that they also have this effect in the same shop where I purchased my Orange amp so it would be easy to test it. Last week I went to the shop to buy a footswitch (which I did) so I've tried mooer red truck (and other pedals) - my conclusion is that this mooer truck is great it sounds really good but I've decided not to buy it and to go all analogue way. Let me explain - I was using Peavey Delta Blues which is similar enough (12AX7A preamp - EL84 poweramp) and the result was good but there was something that made me decide to avoid this device. boost/od/drive is excellent, delay also, reverb is ok and same goes for the modulation but there are few downsides...first even if it is solid built I didn't liked pots and switches - plastic looks little bit cheaper and pots are too small. Don't get me wrong quality is ok but I simply didn't liked it. The thing that I really didn't like is that flanger and chorus are dedicated to the same effect (phaser and tremolo are separate) and I wasn't able to get chorus that would satisfy my needs. It's ok but simply not good enough and effect that I use most of the time regarding modulation is chorus so it has to be "perfect for "my ears". I would say that this multieffect is 4 out of 5 (or 8 out of 10) so I've decided to avoid it. For now I'll buy EHX Memory toy and EHX Neo Clone - I've already owned them and they are really suited to my taste. They will be in this shop tomorrow and I'll buy both. After that in next few weeks I'll probably order Finhol Accutronic Reverb from Thomann because it's all analogue real spring reverb which is almost the same as if Rocker 15 would have reverb inside the amp. When I'm done with this I'll see if I need boost/wah/phaser/flanger or I'll just use what I have (amp with it 2 channels + tuner/chorus/delay/reverb). See you in next few days when I test those effects!! !